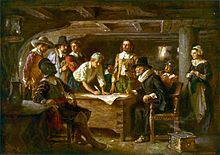 Christopher Martin (1582 – 1621) and his family traveled on the Mayflower in 1620. Martin, his wife Mary, son, Nathaniel and step-son, Solomon all came from Billericay in Essex England. Martin was a merchant by trade. The family did not believe in the Church of England. In 1612, Martin and his wife would not take Holy Communion. Another time, Nathaniel and Solomon made the Church Vicar angry with during a service. Martin got into trouble because he would not give church officials the financial accounts he kept. Martin and his family joined a Separatist church. They all wanted to go to the New World. Martin sold his property and bought passage on the ship. The people asked Martin to help them by buying supplies. He did not spent the money wisely. He purchased things like beer, wine, salted beef and pork, dried peas, fishing supplies, muskets, armor, clothing, tools, and other things to trade with the Native Americans. One thing he purchased, the screw-jack, would be very useful to keep the Mayflower from sinking. There were two ships going to Virginia Colony, the Speedwell and the Mayflower. Martin was assigned to be the leader of the passengers on the Speedwell but the ship needed repairs. A fellow passenger and official of the trip, Robert Cushman said, that Martin will not listen to them, nor allow them to go ashore in case they should run away. Some of the passengers quit the voyage to return to London and lost much or all of their money. Others boarded the Mayflower which became very crowded. Christopher Martin left on Mayflower in company with his wife Mary, his servant John Langmore and his stepson Solomon Prower. Nathaniel Martin stayed in England. When the Mayflower was docked in the Harbor, Martin and other men went to land to find a place where they all could live. In the winter of 1621 Martin, his wife, son and servant became ill and died. Martin and his wife Mary were buried in the Cole's Hill Burial Ground, Plymouth. There is a plaque in the United Reform Church in England to honor the Mayflower passengers. The plaque names Christopher Martin, Marie (Mary) Martin, Solomon Prower and John Langerman. Robert C. Anderson. The Great Migration Begins. Boston: New England Historic Genealogical Society, 1995. Robert C. Anderson. The Pilgrim Migration. Boston: New England Historic Genealogical Society, 2004. R. J. Carpenter. Christopher Martin, Great Burstead and The Mayflower. Chelmsford, Essex, 1982.